Starbeat hosted the Live Finals of their Top Latte Artist in Vancouver contest Friday night at Kafka’s Coffee Shop on the Emily Carr campus. The event was sponsored by ECM, Breville, Canadian Barista Academy, Barista Canada, Storm Brewing, Agro Roasters, and Kafka’s Coffee. 16 competitors battled it out in front of 5 expert judges and a crowd of over 150 people to see who would win the grand prize of $2,500 and earn the prestige title of Top Latte Artist in Vancouver 2018. Guest Judges included Tristan Mapstone, Laura Perry, Sammy Piccolo, Aaron Kafka, and Cole Torode, all legendary figures in the coffee industry. The entire event was led by Coffee Legend Les Kuan from the Canadian Barista Academy and MC’d by Starbeat’s own Hippie Mike. In July of this year, Starbeat hosted a 31 day online qualifier event where over 50 baristas entered a 1 minute video of themselves creating latte art for the world to vote on. The Top 16 qualifiers, based on overall points, were invited to perform and compete at the Live Finals on September 21st, 2018. Each competitor had a total of 2 minutes to make as many lattes as they wanted but could only submit 1 to the judges for scoring. They were scored on 4 categories: Symmetry, Detail, Contrast, and Difficulty. The competition began at 6:30pm until 8pm with some breaks in the middle for people to recharge their coffees and beers. ECM and Kafka’s provided Free Pizza for the entire crowd, and Les Kuan took the audience upstairs at 8 o’clock for some free training on how to make “Café Quality Coffee at Home on a Breville Oracle Touch Machine”, where 15 random people got to compete to win the machine itself. Awards took place around 9:30pm and the prizes were given out. 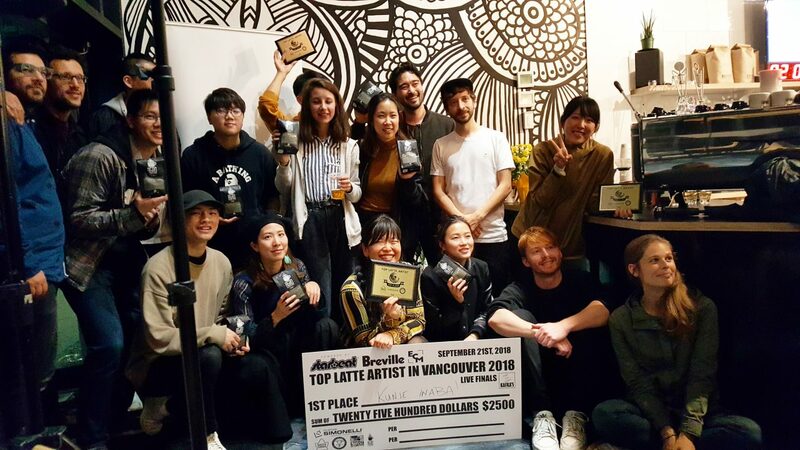 Huge Congratulations to Kunie Inaba for taking 1st place in the competition and being officially named “The Top Latte Artist in Vancouver”. A big thanks to all the competitors and audience members for coming out and making it an awesome night, and thanks to Kafka’s Coffee for providing the venue. Check out the scoreboard below to see all competitors’ final audited scores and Follow @starbeattalent and @starbeatevents on Instagram to find out what’s coming up next!